We welcome rentals at YPT and have a variety of venues to suit your production needs. The Mainstage (Susan Rubes) Theatre is a 460-seat, proscenium-style theatre with a raised, sprung, masonite stage floor and a full complement of theatrical lights, sound and draperies to suit almost any theatrical production. All types of shows have come through our space, including theatre festivals, dance recitals, showcases and corporate meetings. Our core rental season for the Mainstage is from mid-May until the end of June. 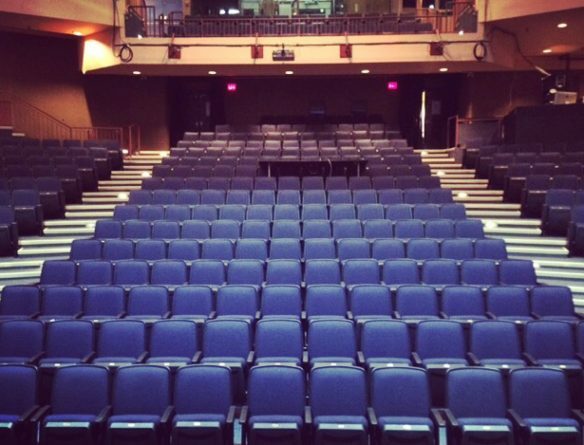 The Studio (Nathan Cohen) Theatre is an 115-seat, black box style studio. This room is used as both a rehearsal hall and a theatre. It comes with a small lighting and sound system and pull-out bleacher seating for 115 kids or 90 adults. This room is available throughout the year in and around our programming. We do, however, use our Studio every Saturday (daytime) for our own YPT Drama School. The Theatre Lobbies are located on all four floors of the building and can be used for receptions and events, workshops, classes or meetings. The Production Shops are located in the basement onsite in our own building. We have the ability to build full production shows, including scenery, props, and wardrobe. The Rental Rates vary depending on the type of event and amount of days you will be using our facilities. We have special rates for not-for-profit and community groups and our friends with the TDSB – and standard rates for commercial groups. Rental rates do not include additional labour charges for technical and front of house personnel. We also have the ability to sell your tickets through our box office. Please ask us for more information. Familiarize yourself with the building by taking a behind-the-scenes tour with Artistic Director, Allen MacInnis. For bookings and general inquiries, please contact us by telephone: 416.363.5131 x244 or email: online(at)youngpeoplestheatre.ca.